In the nearly 30 years I’ve been a theatre insurance broker I’ve read many Theatre Insurance Policies. Over those years I’ve adopted an approach to help me determine what’s covered-and what’s not, relatively quickly. In today’s Post, I thought I would share these very simple tips with you. They will make you feel more comfortable with the policy you are buying and help you form better questions when discussing the coverage with your broker or dealing with a claim. Before we begin, it’s important to know here are 4 essential parts of any Theatre Insurance Policy. For the purpose of this discussion, I will be referring to a ‘Broad Form” type of policy (often referred to an ‘All Risks’ policy; a terrible name by the way, as I’ve yet to see a policy that covers everything!) This type of policy has become the most common in the industry and is generally considered a broader form of coverage than a ‘Specified or Named Perils’ policy. Broad Form policies outline what type of claims you will NOT be insured against; whereas, a Specified Perils policy outlines the types of claims which are insured by the policy. Move on to the Definitions: Definitions broaden a single word or words beyond the common-use meaning, to define what it means in your policy. For example, the word ‘Insured’, may be broadened to include your corporation, employees, officers, volunteers, shareholders, etc. Using Definitions makes reading the policy less repetitive and easier to read. Sometimes a definition will also tell what it doesn’t mean, so watch that. Now, read the Exclusions: It is here where your coverage is shaped and the insurance company tells you what will NOT be covered by your policy. Some insurance companies have this under a section referred to as ‘What’s Not Covered’, or ‘Causes of Loss Not Covered’. Often I’m asked the question, “So what are we covered for?” While this is a great question, to me it’s more important to know what you are NOT covered for as it there where the surprises live. This is why I read the Exclusions. Sometimes you will find there are exclusions specific to certain sections of your policy, and then there are some known as General Exclusions which apply to your ENTIRE policy. If you see an exclusion that you don’t like or you feel it too greatly restricts your coverage, be sure to raise this with your broker. Some exclusions can be removed by paying an additional premium for the added coverage. And finally, look for ‘Endorsements’: these are used by insurance companies to modify their standard policies. They can broaden or restrict your coverage. They can usually be found listed in the front section of your policy known as your ‘Policy Declarations’.These are the front sheets on your policy where the insurance company lists your insured amounts, deductibles and premiums. There will be other parts of the policy called Statutory Conditions and General Conditions. While these are important, they are generally common to most policies and can be read once you have tackled the parts I’ve listed above. And one final tip: when it comes to making a claim under a Broad Form policy, it is your insurance company that has the responsibility to establish that one of the exclusions applies to your claim. Any ambiguity will be read in your favour as they were the ones who created the policy wording. By contrast a Named or Specified Perils policy requires YOU to demonstrate that your claim has resulted from one of the insured loss types specified in your policy. By using these 4 simple tips you will quickly be able to understand your policy, feel more comfortable with it, and be able to ask questions that may help broaden your insurance protection. There is nothing like a night out at the theatre. Getting dressed up in a fine outfit. Hiring a babysitter for the kids. And being swept away in a dark room that allows you to forget about real life, if only for a few hours, is well worth the price of admission. The idea that anything could shatter the illusion is unconscionable. “What could ever go wrong?” you might ask. At a UK production of “Grumpy Old Women,” the audience found out the hard way. At Cheltenham’s Everyman Theatre, the audience was evacuated due to a pyrotechnic mishap that occurred well before intermission. Frustrated theatre goers spilled out onto nearby Regent street as firemen arrived promptly at the scene. Despite its challenges, like many great stories of the theatre, this one has a happy ending. Ultimately the fire was put out and the show went on as planned. Since we’re in the insurance industry however, let’s have a look at some hypotheticals. More than almost any other hazard, fire shows just how important it is that a theatre carry good production liability insurance. Had the pyrotechnic mishap gotten out of control the damage to property and more importantly people could have been immeasurable. While key person insurance would have protected the lead actors, and the company’s theatre insurance would have covered sets, and costumes, without the proper liability limits an out-of-control fire is enough to draw the curtain on any business due to its potential to cause personal injury. 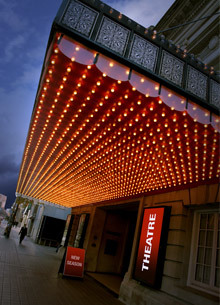 Furthermore one production’s damage to a theatre has implications for said theatres future productions and revenue streams, all of which need to be protected. In the end, “Grumpy Old Women” proved more comedy than tragedy.